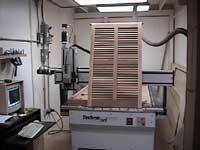 CNC Automated Carpentry uses low-cost CNC technology to produce intricate wood components. In Bermuda, intricate shutter designs are in high-demand. Technology is allowing CNC Automated Carpentry to meet these often complicated customer needs. Two Bermuda business-partners tossed traditional tools in favor a low-cost CNC router while building their company. Current revenue from their custom wood wood working business is giving them no cause to look back. Bermuda has a high demand for intricate and custom wood working such as shutters, as well as decorative pieces such as carved signs. In the past, skilled craftsman produced these jobs using costly, time-intensive processes, and often had to turn down work too complex to build by hand. CNC Automated Carpentry of Bermuda has since revolutionized the Bermuda custom wood working market by putting a new CNC router to work that automatically produces the most complicated shapes without manual supervision after they have been defined in a computer aided design (CAD) software. The company does more work with fewer people and produces exactly what their customers want. With only three full-time employees and one part-time staff member, the company is now producing approximately $1 million in revenues per year. CNC Automated Carpentry was started by two partners with years of construction experience using traditional tools. Their experience showed them the amount of time and skill required to craft complex pieces, as well as the limits imposed by using manual methods. The CNC router allows the company to efficiently produce a host of complex woodworking components. In Bermuda, nearly every house has shutters to protect against storms and to provide shade in the heat of the day. Since homeowners seek attractive shutters, highly-stylized designs with complicated cross-sections and decorative touches are common. Customers often bring samples into local woodworking shops and are shocked when they learn the cost and lead-time involved in turning their ideas into reality. Vesely and his partners saw an opportunity to build a business by using CNC technology to meet the needs of these potential customers. After researching routers, they purchased the Techno CNC Machine from Techno-isel. The machine performs production routing and drilling on a wide variety of materials including wood, plastic, MDF, solid surfacing materials and nonferrous metals. The machine price included CAM software capable of both creating designs and importing them from nearly every CAD system. Since installing the new machine, Vesely and his partners have kept it busy with nearly continuous use, producing shutters, cabinet components, countertops and a wide range of other custom woodwork. Vesely said that he is now able to accommodate nearly every customer that walks into his door looking for custom shutters. The technology has allowed the company to produce a range of other complicated component designs, Vesely said. Vesely and partners have also developed a new business subcontracting the production of templates used to produce marble countertops for companies that specialize in that field. âThese countertops are often produced in odd and complicated shapes with a lot of radii and curves,â Vesely said. The advantage of using the CNC router is that it produces a much more accurate template, usually eliminating the need for finishing the last Â¼ inch to Â½ inch of material with a hand router at the job site. The ability of the router to cut very complicated shapes with a high degree of accuracy saves the installers time and money. CNC Automated Carpentry can also produce more complicated shapes than could be produced by hand in the past. Vesely concluded that the new router has been the key to the companyâs outstanding success in the first few years of its existence. âMore than half of our revenues this year have been directly generated by the CNC router,â he said. âWe are gaining a reputation of being able to do the tough jobs at a reasonable price so customers are beating a path to our door."